I am happy to say that Spring has finally arrived! After the longest winter in memory, the flowers on campus are peeking out and everyone’s steps are a bit lighter. Last weekend was Honor Scholar weekend and the students are counting the days until the end of classes. 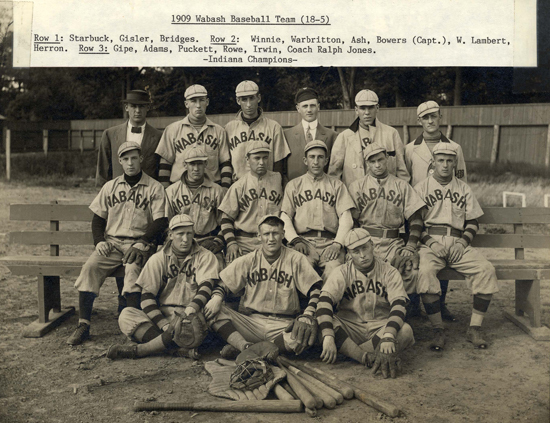 Major league baseball opened its regular season this week so in the spirit of spring, here is a Wabash baseball story with an honors scholar tie-in. This tale comes from Max Servies’ Wabash athletics history, Some Little Giants. Max [W1958] is familiar to alumni and friends of the college as the hard charging wrestling coach for most of the second half of the 20th century. Max also served as an assistant coach for track and football and from 1965-1998 he was the Athletic Director at Wabash. Max has a passion for the great athletic history of Wabash and has compiled it into this incredible project. Enjoy! From Some Little Giants an athletic history by Max Servies. Back Row: Gipe, Adams, Puckett, Rowe, Irwin, and Coach Jones. Middle Row: Winnie, Warbritton, Ash, Bowers, Capt. ; Lambert and Herron. Front Row: Starbuck, Gisler and Bridges. The following letter was written by John W. “Bill” Irwin `09 to Coach Dave Lantz. Bill was an A-student and Phi Beta Kappa out ofCaledonia,Ohio. He enteredWabashthe fall of 1906 and graduated in three years. He tells Coach Lantz of some of his baseball experiences while atWabash. His 1909 team went 18-5 and took the Indiana Championship. I am enclosing a small check for your baseball trip. If I were still working and not retired, I’d like to make it larger. Yes, I pitched in 5 games in one week—three full games as I recall. But it had compensations. I was sent to the hospital nights for two or three weeks where two pretty nurses massaged and baked my right arm and shoulder until midnight. Then came a fine midnight snack when the real patients were asleep. That was almost like going to Oberlin today with coeducation and modern living. For a country boy in 1907, it was a great life. But always remember there were at least two nurses. I am enclosing a copy of the 1908 team that included “Abe” Diddel and “Piggy” Lambert. Diddel was truly a great athlete and is yet in golf. He always maintained that “Bill Irwin prayed harder than he pitched.” I guess they thought I had some spiritual influence because I was used regularly with better pitchers on the bench. Actually, we never had a baseball coach. My first year (1907) was the last season of Francis Cayou, who had made the Little Giants famous in football. He coached baseball at the start of my first season so it was natural for good football players to “make” the baseball team. I recall my first game was againstIllinois and a very famous basketball and football player had “usurped” first base—“Bill” Sprow by name. In the first inning a slow roller was bounced to me and I lobbed it over to Sprow. He dropped it and yelled, “Shoot ‘em over here, Freshman.” In the third inning I fielded a similar bouncer and let Sprow have it full force. I hurt his nose and lip and probably should have been kicked out of the game. We lost the game by a big score but Sprow and I became the best of friends. He quit baseball. 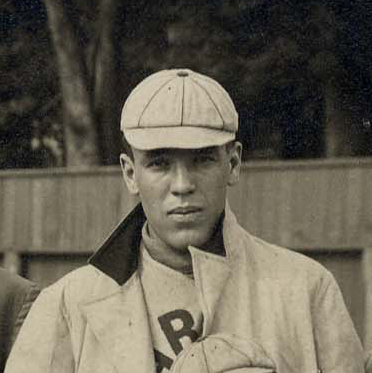 Following Cayou, Ralph Jones, the celebrated basketball coach of Wabash and Crawfordsville High School took over baseball. He did not know too much about the game but he could control a team. He always liked to say about me, “Yes, Bill Irwin is fast – fast to the ground.” And he was not far wrong. My first year at Wabash was rather terrifying. I had come from a smallOhiotown with a new suit, which was not at all in style. I never wore it. Supposedly my small town diploma would not permit me to enterWabashand I was supposed to start in the Academy. Fortunately, somebody suggested I try the honor scholarship examinations and I did so. Since I taught country school when I was sixteen and seventeen, I could read and write rather effectively. The net result was that I not only got to enterWabashbut also got all my tuition paid. Luckily I did not know one thing about fraternities or sororities. I could play pool rather well and that made up my social life. I was unknown and I remained unknown despite the fact that I began getting good grades and made the debating team. I also worked as a laborer on a new golf course and made enough to get a suit of clothes made college style — long coats and peg-top trousers. I’ll never forget that new suit which arrived about the time I had made the baseball team. Life was transformed. It is strange, Coach Lantz, how seemingly trivial things can so transform our lives. Even if I had the new suit, however, I did not realize the significance of the fact that certain members of the Kappa Sigma fraternity were “looking me over”. I pledged despite the dire warnings of the many, many non-fraternity friends I now had. I should say that at the time the Kappa Sigma fraternity was probably the poorest on the campus and I am, of course, happy that this is no longer true. I have taken the trouble to type out this unusually long letter because a coach may often discover a boy who faces some of the problems that beset me my first six months at Wabash. And a wise coach can help such boys. I should add that all was changed when I got back on campus in the fall of 1907. I was elected class president and participated in just about everything. And I decided that I could complete the work of the next three years in two years. I had studied so hard as a freshman that the following subsequent courses looked easy. Hence I could afford to spend most of my time in classes except during the baseball season without lowering my grade average – except for a couple of B grades in Botany. I had to get in that extra year of science and some day I’ll tell how Dean Mason Thomas guided me through it with the assistance of a most able partner for my field work. He was a Jake Schramm, afterwards noted at Cornell for his work in that field. I could barely distinguish between a dandelion and a thistle and Dean Thomas knew it. He also knew I could do the book work of the course, and he was a baseball fan. I got through Botany without too much damage to my scholastic record and I became acquainted with a wise man as well as a great teacher. With both glaucoma and cataracts as handicaps, I have typed too long a letter. Just put it aside for a rainy day. Fortunately I have no advice for college pitchers other than to recommend – for college batters – a high fast one and a slow low one. If a pitcher can acquire control, now as then, he has an advantage over the batter – most always. But I would be the last to deny the efficacy of “a prayer with the pitch”. Bill Irwin closeup from the team picture.